I have been visiting Elviria, on the Costa about 10km shy of Marbella (coming from Malaga), a good 13 years now to visit my in laws. The beach is good, the lifestyle relaxed, there are plenty of good golf courses around but generally I struggle to find anything interesting to drink. (In fact, somewhat ironically, this blog was actually born down here at Easter.) Let’s be fair – I had a choice of Tio Pepe, La Guita, La Gitana and Solear, so I should not overdo the complaint, but it wasn’t the offering a thirsty traveller dreams about. So imagine my joy at witnessing this vastly improved sherry offering at the local Supersol just now (in fact I couldn’t fit the top shelf in the shot, so it is even better than it looks). 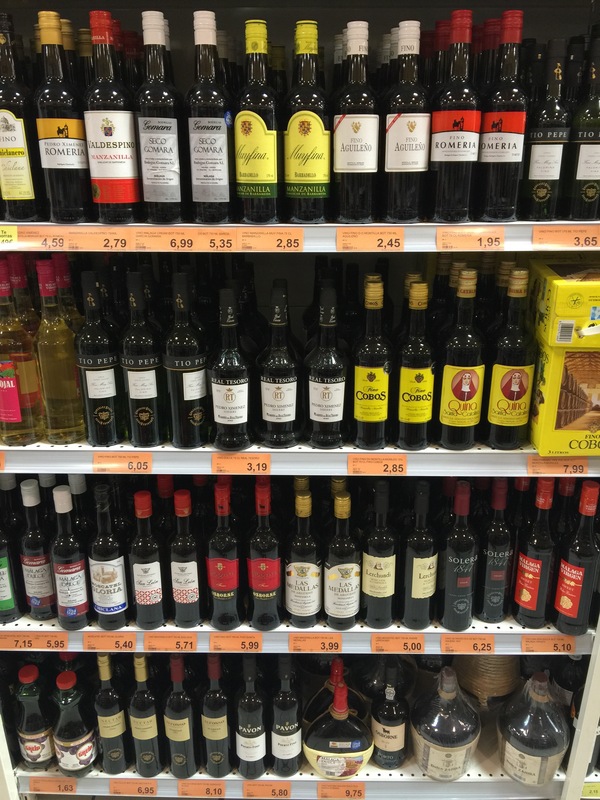 The sherries are of course sharing the shelf with the malaga wines, and ok, we are not looking at the top end of the range, but there is nonetheless a cracking choice of finos and manzanillas here. In the end I picked up a bottle of the Las Medallas that I tried recently in Taberna Palo Cortado, but I am looking forward to having a good go at these in general. In any event, it must be great news to see a bigger selection of these great wines on the shelf. And just look at the prices!